• Some believers willingly sin believing God’s grace will cover them, while the blessing of grace is not to sin, but to release guilt and condemnation when they make a mistake. • Other believers think they must “work” their faith by ritualistic prayer, confession, or Bible study. Although all these things are good, Jesus Christ set believers free from works of the law. God wants a relationship where He can communicate directly to each believer. • Grace and faith work together. When believers receive the unmerited favor or grace of God, they can release their faith without doubt or reservation and receive God’s blessings. 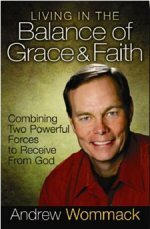 Andrew Wommack in his logical, practical style brings believers back on track in their Christian walk through living in the balance of grace and faith.